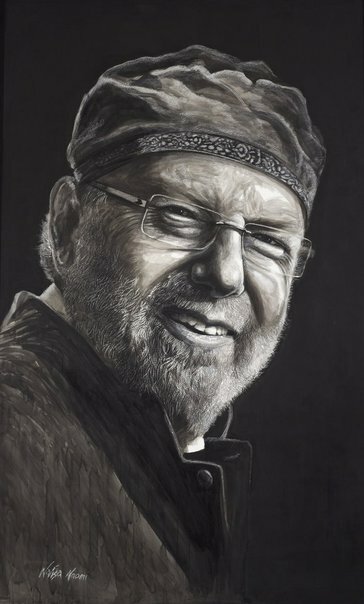 Sydney artist Nafisa has been awarded the Packing Room Prize in conjunction with the 2010 Archibald Prize for her portrait of Glenn A Baker, rock historian and travel writer. Three-time holder of the BBC’s Rock Brain of the Universe title, Glenn A Baker is renowned for his encyclopaedic knowledge of rock music. He has written books and magazine articles on the topic, interviewed celebrities, managed bands and promoted tours of international rock stars. He is also a widely read, award-winning travel writer. Born in Mumbai, India, Nafisa is a full-time artist living in Sydney. She has exhibited work in over 100 group shows and won over 50 awards and commendations including the First Prize (Gold Medal) at the 2007 Florence Biennale. She has been a finalist the Dobell Prize for Drawing, the Blake Prize for Religious Art and in numerous portrait prizes including the Portia Geach Memorial Award. She won the 2008 Black Swan Prize for Portraiture. The Packing Room Prize gives the Gallery staff who receive the entries for Archibald a chance to vote for their favourite Archibald portrait.